It's tricky isn't it? The act of giving. Often we spend so much time worrying about how much something costs, we forget that the best birthday present ideas are those that come from the heart. The wonderful thing about presenting a photo gift to a loved one is that no matter what gift you choose, they all speak volumes. We're excited to present you with birthday gift ideas to cover significant milestones from the exciting 18th birthday to the amazing 80th celebration. To view a full range of ideas for landmark birthday celebrations, simply follow the prompts. With any of these options, you're bound to make someone smile on their special day. With this stunning silhouette wine collage, you can make sure your friend never forgets the awesome time you've had together. Let's get this party started, right. Let's get this party started, right now! You can still celebrate an 18th without getting your friend a boring bottle of booze. Put the word out among your friendship group to find the best photos of everyone having fun together. All you have to do then is choose the best of the mad bunch and upload them using our easy-to-use online collage creator. If you love the look of this funky collage, but your friend doesn't drink, don't worry. We have such a wide selection of fun silhouette styles, you're bound to find something that better suits their personality - heart, butterfly, balloon. An artistic collage is easy, affordable and unforgettable - which makes it the perfect way to honour 18 years. Honor all that is 'crazy beautiful' about your friend with a gift featuring all the things they love the most. Get a group of friends to all pitch in for this thoughtful gift, perhaps one of the most creative birthday present ideas around. 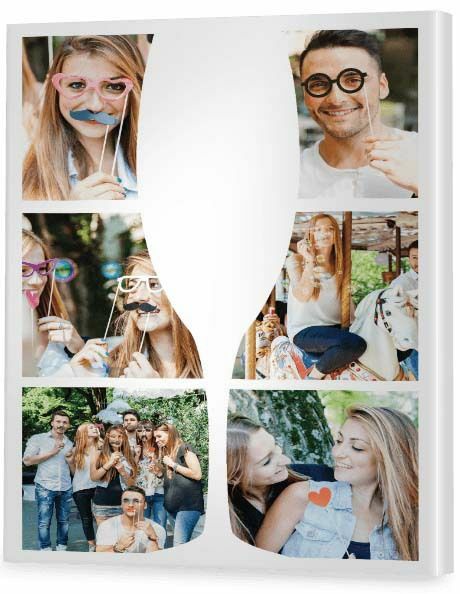 This canvas wall display offers a great opportunity to feature a massive photo of your friendship group altogether surrounded by a smattering of other special photos. Use the other spaces to feature images that the birthday girl or boy is passionate about. It could be shopping, horses, hockey, swimming, film, writing - it doesn't matter. What a way to show you value your friend and all that they do. Whether the 21 year old in your life is living away from home or not, a new piece of art will transform their new living area or old bedroom into a better place to be. 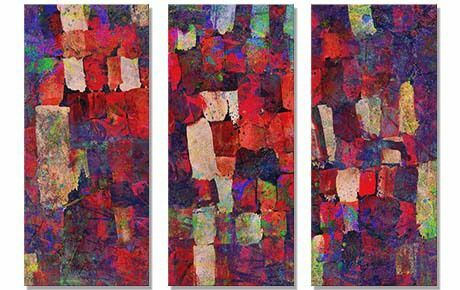 An abstract art print is a wonderful introduction to the world of art. A non-traditional artform, abstract works are full of life and color - perfect for a young person. 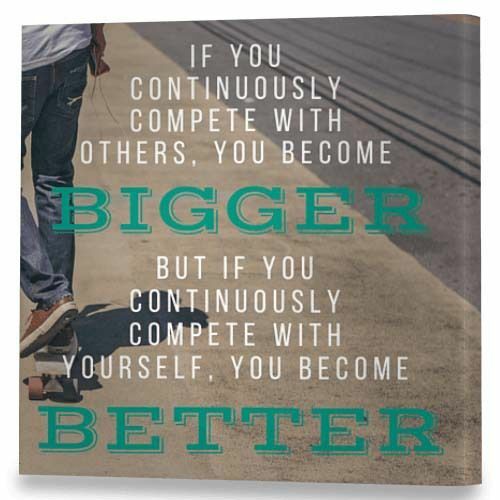 Gift your friend or family member with a single print or spoil them with a split image canvas and, once they see how much it dresses up their home environment, they'll be coming back for more. If your friend talks about traveling to far away places, help them along with a 21st gift that will inspire them to make it happen. 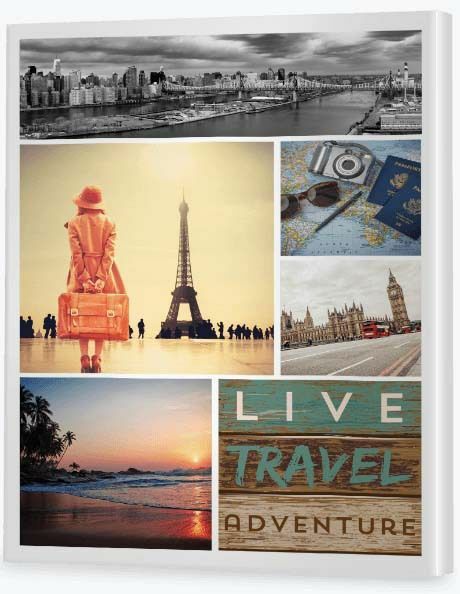 Rather than giving them a chalk board to write on, put together a travel themed 'Live, Travel, Adventure' collage full of photos of places they yearn to visit. They say a picture is worth a thousand words, so perhaps five gorgeous pictures from all around the world could very well inspire savings of thousands of dollars - enough for a round the world ticket. It's a bucket list like no other - not only inspiring to imagine, but beautiful to look at. It's time to help make those dreams come true. If your favorite work colleague is turning 21, give them a reason to stick around - give them an inspirational quote. Canva, a nifty graphic design tool, helps you easily create custom images that you can then upload onto a Canvas Factory print. After you've chosen an inspirational quote, hop onto Canva, choose any square shaped design then select a template suitable for your quote. Type in your quote and download 'PDF for print'. Too easy. All you have to do then is attach your print to an email and send it to [email protected] telling us what size you'd like your square single canvas to be. We'll look after the rest. 30 is a wonderful opportunity to pause and count your blessings. Whether it's a gift for your husband, wife, fiance, fiancee, boyfriend or girlfriend, 30 is a milestone that deserves attention. By the age of 30, we have known both great heartache and great joy. There's a story worth telling. We suggest using a classy acrylic glass collage display to tell the story of your relationship from the beginning to the present – perhaps your first date, the wedding, honeymoon, pregnancy and new baby. Sisters share a special bond that cannot be broken. It's all about sharing laughter and wiping away each other's tears. Choose a 30th birthday gift for your sister that makes it clear you're not only her biggest fan, but her biggest support. This idea is so simple. 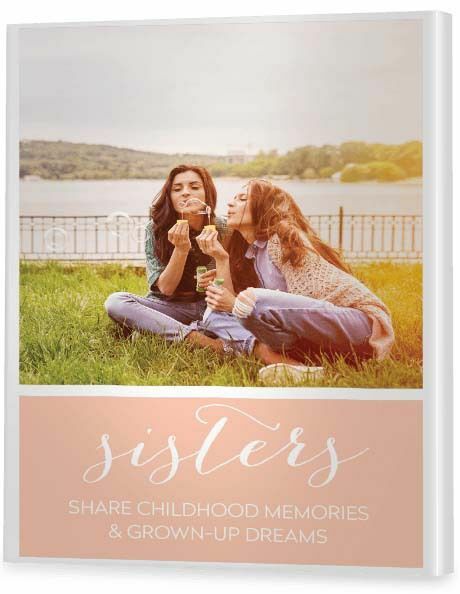 It features just two photos within a traditional style of collage, one large frame for a photo of you and your sister together and a smaller frame underneath for a special quote. Use Canva to create the quote then email us a high quality 'PDF For Print' version of the image along with the photo of you and your sister. Combined, they will look simply stunning on canvas - what a way to spoil your sister. Canva is an exciting tool that lets you choose an image with any color background and lets you choose from a range of fonts. Then you simply type in whatever quote you like! In the midst of ageing, we often forget how grateful we are for our wonderful friends and family. 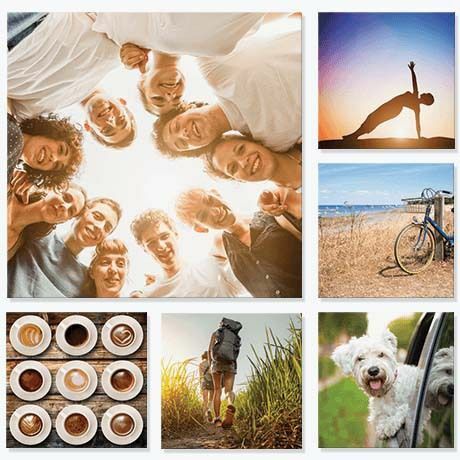 A gorgeous modish collage print, featuring warm, joyous photos of friends or family, will inspire the 40 year old in your life to remember how treasured they really are. Sometimes, when we're caught up in the stresses of life, we forget to appreciate the small moments. A glance at a gorgeous wall collage can help jolt us out of a funk and back to focusing on what's important. Lover of the outdoors? Now they can enjoy a piece of nature inside the home, without the need for watering. If your friend likes to potter in the garden or simply loves going to parks and smelling the roses, here's a precious gift - full of life and color - that they'll simply adore. To create your own collage, you can choose images from our gallery or you might even like to sneak around your friend's garden, taking photos of their floral handiwork. 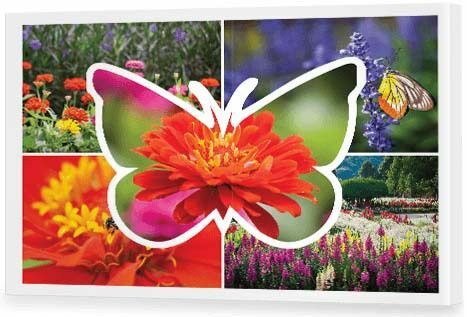 Fill our blank modish butterfly template and color their wall with Mother Nature's beauty. Help make their 50 years look good! 50 is a time for rejuvenation. Celebrate your loved one’s youthfulness with a classy, sassy metal photo print. 50 and winning? It's a time to celebrate self and the 50 year old woman in your life deserves nothing less than the royal treatment - their gorgeous self up in lights. 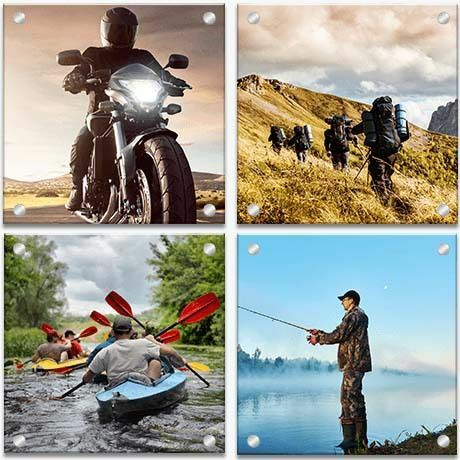 Print a photo of them happy and smiling on beautiful brushed aluminum. It is treated to resist corrosion, so no matter where your friend hangs her photo, it is guaranteed to last. Getting older doesn't mean you have to suddenly become boring. This funky collage design is for the young at heart. 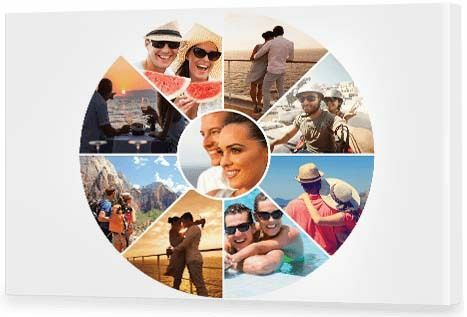 Collect photos of you and your loved one on holidays, at the park, out to dinner - just the two of you enjoying key magical moments throughout your life. Feature photos just from your younger years or combine them with more recent snaps to create a wheel of life using this funky circular modish design. See it is possible to be forever young. The bloke who has everything isn't the man with the biggest house. He's the man with a great bunch of mates. If you're a bloke looking for something clever to give your mate or your brother to celebrate his 50th, this is something that will honor all his hobbies or achievements - that have nothing to do with his work life. Ask his family to collect a variety of photos of your mate doing all the things he loves to do then create a glass photo display. This is something he can feature pride of place in his workplace or home office - something to show there's more to life than work. Because there is more to life than work. Her big heart knows no bounds. She's always the one giving her time to friends and family. Now it's time to give back. You know who this gift is for. She's the faithful wife. She's the nurturing mother. And now she's the loving grandmother. It's time to fill her heart with the love of family. Plenty of hugs should do the trick, but her 60th calls for that little bit extra. 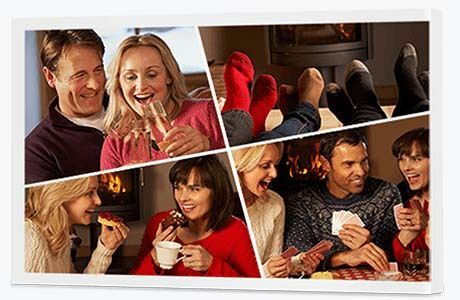 This heart collage, filled with treasured family moments, will warm her heart day in, day out. Pets may not be our whole life, but they sure make our lives whole. This gorgeous gift honors all that and more. A life rich of pets is a life well lived. If the 60 year old in your life is an animal lover, she will have known both the joy and the loss of numerous furry friends. They may be gone, but they're not forgotton. 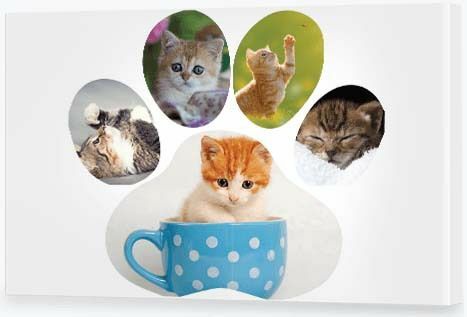 Our paw collage is a wonderful way to honor their little furry lives and keep their spirit alive. Whether they are lucky enough to retire by the beach or simply love to travel, this 70th birthday gift means they can also enjoy their favorite place from the comfort of home. 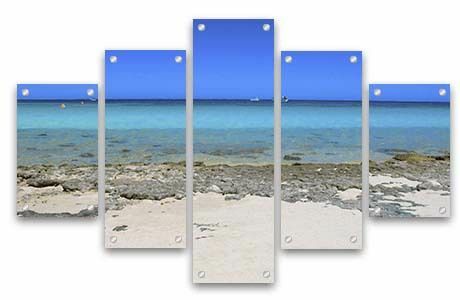 A split image acrylic glass print is a perfect way to display landscape photography. The opportunity to gaze upon the things we love the most fills our spirit. And every 70 year old deserves nothing less than that! As we know, growing older is not all rainbows, sunshine and lollipops. There's a lot of grief and loss that comes with ageing. Even though a 70th birthday is a time for celebration, it's also time for reflection. If your loved one has a hole in their heart for a husband or wife who is no longer by their side, it's OK to honor this. You can make this gift a surprise or let them know your intention. 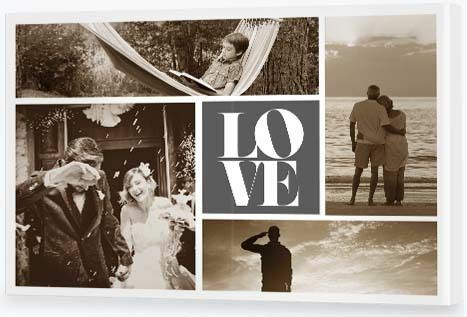 Either way, find photos from times gone by and use our 'love' themed collage to create something of tremendous value. Say 'Happy 80th birthday from all the family' with a large wall display full of their favorite photos. 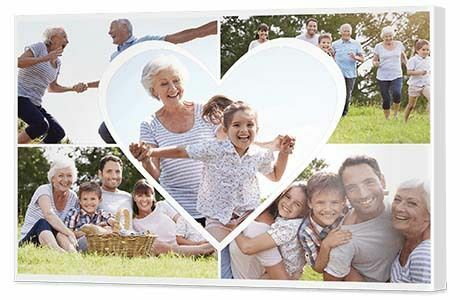 Get the whole family together to create a large eight panel wall display for your 80 year old Mom or Dad. Let each family member contribute a chapter to your parent's unique life story. As your imagination grows, so will your display. Get fresh news and unique ideas delivered right to your inbox. Canvas Factory provides high quality canvas prints at an affordable price. 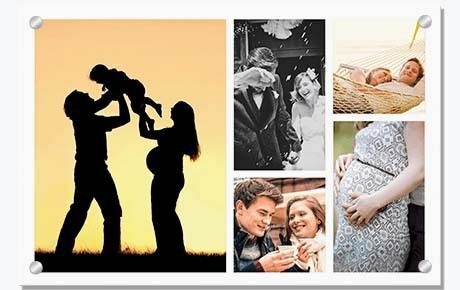 We believe in providing the best canvas printing services to ensure that your photos are preserved on canvas exactly as you want them, easily and conveniently. Transform your favorite photos into beautiful canvas prints. High quality materials and low prices with 70% off RRP!